Three of the four majors were played on grass in 1969, so Laver’s win at Roland Garros stands out a little more in his second calendar Grand Slam. Yet, this turned out to be The Rocket’s last Wimbledon final. 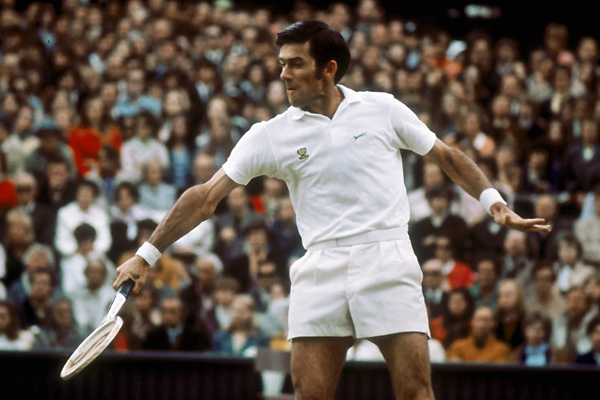 Moreover, Laver faced a man who would win the next two Wimbledon titles in 1970 and 1971. Newcombe won seven majors altogether, so it’s not as though Laver had the benefit of a manageable Wimbledon final opponent en route to a Grand Slam. In 1962, by comparison, Laver’s Wimbledon final foe was Martin Mulligan, who never won a major singles title. Laver’s 1969 Grand Slam was much tougher than his first go-round in 1962; Wimbledon forms a core dimension of that reality. He played in the 1954 and 1974 Wimbledon singles finals. Ken Rosewall might not have written the book on tennis longevity, but he certainly authored several chapters. These two men carved out distinct places in tennis history. Drobny was something of a trailblazer, doing right after World War II what Martina Navratilova would do in the 1970s: Bolt from a Communist regime in Czechoslovakia to seek a freer life elsewhere. Drobny also happened to be a lefthander (like Navratilova), and when he captured this title, he became Wimbledon’s first lefty men’s singles champion since Norman Brookes of Australia in 1914. Drobny eventually became a citizen of Great Britain, but in 1954, he carried Egyptian citizenship. This win therefore enabled Drobny to become the first and only player with citizenship in an African country to win a Wimbledon singles title (either gender). This match is also notable because it marked Ken Rosewall’s first Wimbledon final. Rosewall, Rod Laver’s greatest rival, will always be remembered in tennis circles for the quality of his longevity. A full 20 years after this 1954 final at SW19, Rosewall made yet one more trip to the championship match at the All-England Club, losing to Jimmy Connors in the 1974 title bout. Connors, interestingly enough, forged one of the few careers that can stand up to Rosewall’s in terms of high-level performance over an extended period of time. In 1984, John McEnroe shrugged off the most painful and important loss of his career (to Ivan Lendl in the French Open final), slashing his way through Wimbledon with noticeable ease. McEnroe dismantled Jimmy Connors in that year’s Wimbledon final. He then beat Ivan Lendl in the U.S. Open final en route to an 82-3 season, easily one of the best in the history of the sport. In the summer of 1985, it seemed reasonable to think that McEnroe — still only 26 (which is precisely when Bjorn Borg retired from tennis to the shock of many) — had more major titles in front of him, especially at Wimbledon, a tournament tailor-made for his serve-and-volley style. It’s quite possible that McEnroe — who made the 1985 U.S. Open final but lost to Lendl — would have lost focus and drive even if he had won Wimbledon in ’85. Yet, it’s very hard to refute the notion that Johnny Mac’s upset loss to Curren, an emergent South African-born player, had absolutely nothing to do with the steady decline of his career after 1984. Among the 20 best men’s tennis players of all time (McEnroe’s certainly on that list), no player left more accomplishments on the table than the brash New Yorker whose Wimbledon reign ended so abruptly… and never resurfaced. Connors didn’t play the French Open for most of the 1970s, so the rivalry between Connors and Bjorn Borg played out at Wimbledon and the U.S. Open. Connors was regularly able to stop Borg at the U.S. Open, but Borg locked down Jimbo at the All-England Club. This result in the contentious 1977 final ultimately enabled Borg to gain and then maintain supremacy over Connors. Had the fifth set gone the other way, these two careers might have traveled in different directions, causing the two men to be spoken of in different terms. Among Roger Federer’s 17 major titles, only the 2009 French Open stands out as a particularly significant non-Wimbledon entry. Most of Federer’s most important wins came at the All-England Club, and this one is the most underrated and/or the easiest one to overlook. Federer won Wimbledon seven times, but in this match, he was overpowered by Roddick for the better part of the first two and a half sets. Federer received a gift from the tennis fates midway through the third set, trailing Roddick by a break and knowing that the American’s serve could have carried the rest of the match. A rain delay enabled Federer to gather himself, while it forced Roddick to think about his situation. The weather also interrupted the rhythm the American star had developed in the first six games of the third set. Federer, without a coach in 2004, showed the poise of the champion he was becoming. Roddick, so dialed in before the rains came, was not the same player when the third set resumed. Federer snatched the third-set tiebreak (it’s how he’s won a great many Wimbledons if you look at scorelines over the years) and claimed the match in four sets. Had this rain delay not emerged, Andy Roddick might have won the Wimbledon title that so cruelly eluded him. Even more significantly, Federer might not have become the Wimbledon giant he turned out to be. Roddick might have gained enough confidence to win more Wimbledons in the future. The contours of tennis history could have been altered to a considerable extent. Federer’s 2009 win over Roddick certainly possessed a fair degree of significance, but it was more significant at the time (producing Fed’s 15th major) than it is now, with Rafael Nadal almost certain to reach 15 in his own right. The 2004 Fed-Roddick final should be able to remain the more important Wimbledon showdown between the Swiss and the American. If 2004 hadn’t turned in Federer’s direction, 2009 might never have morphed into the event it ultimately became. This match is significant within the larger run of tennis history because it launched Budge’s string of six straight major titles, and because — as this article helps explain — it gave Budge the confidence to beat von Cramm once again in 1937, in the memorable Davis Cup match involving the two players. Budge’s reputation as one of the greatest male tennis players of all time was forged in — and from — these twin 1937 conquests of his German adversary. Budge might have won the calendar Grand Slam in 1938, regardless of what had happened the year before. Yet, if he hadn’t claimed this match, he might not have established the foundation from which he could have registered such a feat. Borg-McEnroe 1980 is the Wimbledon final tennis fans remember from that era of the sport’s history, but the 1981 match was in many ways more significant in terms of defining Borg’s luminous yet relatively short career. This match illustrates the difference between a great match and a significant match… as you’ll also see in the remaining entries on this list. No one would dispute that the 1980 Borg-McEnroe Wimbledon final rates as a better and more memorable match, the one that captured the imaginations of many tennis fans at the time. The 1980 Wimbledon final is the match that’s still talked about, more than a third of a century later. Yet, the 1981 final can rightly be seen as a more significant match in tennis history. This is the highly debatable and speculative point to emerge from the ’81 Borg-Mac rematch: Had Borg won it, the Swede might not have felt quite so inclined to retire from tennis before his 27th birthday. Here’s the much less debatable point surrounding this contest: Had Borg won it, he would have owned six straight Wimbledons. As a point of comparison, Federer managed “only” five in a row, from 2003 through 2007. If Borg had never been knocked off his throne at SW19, his already-lauded name would be spoken of in even more reverential tones. The list of Pete Sampras’s victims in Wimbledon finals is not a bunch of tomato cans, but it’s not an All-Star lineup, either. Hello, Goran Ivanisevic (twice) and especially Cedric Pioline. However, Sampras had to defeat one of Wimbledon’s great champions, Boris Becker, in the 1995 final. The strength with which Sampras shoved Becker out of the way in the final three sets of this match gave tennis fans and chroniclers an awareness of what Pistol Pete had become at Wimbledon. His one hiccup of a loss in 1996 (to Richard Krajicek in the quarterfinals) only magnified the extent to which Sampras owned Wimbledon over an eight-year stretch from 1993 through 2000. 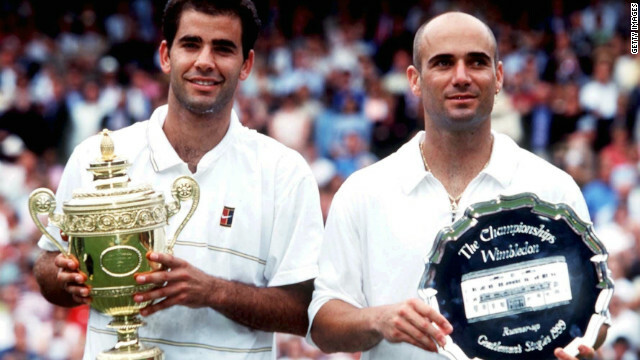 Pete Sampras will ultimately be remembered as a better player than Andre Agassi. The reason is simple: He won more of their meetings in major finals, especially at the U.S. Open and, in 1999, at Wimbledon. Sampras faced a love-40 hole on serve in the first set. The owner of the greatest first and second serve in the history of tennis, Sampras typically blasted his way out of that deficit. He was never threatened again by Agassi on that cloudy afternoon in England. Agassi was the better Australian Open and French Open player, Sampras the better Wimbledon and U.S. Open player. Sampras clearly demonstrated more top-tier consistency in his career, whereas Agassi was plauged by a series of downward spirals mixed in with his many resurrections. For this reason, Sampras authored the superior career. However, had Agassi been able to win the only Wimbledon final contested by the two men, their careers would be placed on a much more similar plane. Moreover, had Agassi won this match, he might have found just enough added belief to win another Wimbledon in the future. It’s worth recalling how wide-open this tournament was from 2001 through 2003. Only in 2004 was a no-doubt favorite — Roger Federer — once again part of the pre-tournament conversation at Wimbledon. Sampras’s 2000 win against Patrick Rafter gave him seven Wimbledons, it’s true. That match was also much more dramatic than this straight-set conquest of Agassi. Yet, to repeat a familiar theme, great matches and significant matches aren’t always the same thing. What applied to the 1981 Wimbledon final relative to the 1980 final also applies here. Of course the 2008 final was a better match than 2007, and there’s also no doubt that the 2008 final (like the 1980 final) will always carry an enormous amount of significance within the larger story of tennis. Yet, 2007 and 1981 mean that much more as far as the history books are concerned. 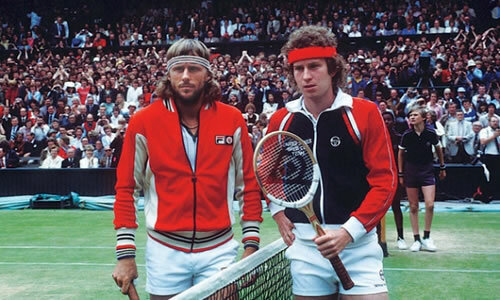 Borg’s lack of career longevity makes the 1981 final impossible to push out of the mind. History’s understanding of Borg would have been so different — and moreover, so much clearer — had he won that match. Similarly, history’s understanding of the Federer-Nadal rivalry would have been so different — and yes, so much clearer as well — had Nadal been able to pull out this particular win. Nadal was not ready to beat Federer in the 2006 Wimbledon final, but he was prepared — and resilient — enough to topple his rival in the 2008 epic between the two men. 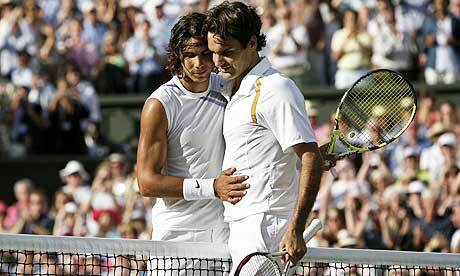 It is this match, in 2007, which represents the in-between match in the “Fedal” rivalry at SW19. Had Nadal won on an afternoon when Centre Court did not have any awnings or overhead structures, due to the renovations that produced a fully functional roof in time for the 2009 tournament, he would have been able to bask in the full sunlight of complete ownership of the Roger-Rafa rivalry at the majors. This match enabled (and still enables) Federer to claim a 2-1 edge over Nadal in Wimbledon meetings. Had Nadal been the 2-1 leader at SW19, it would be 10,000 times harder to give Federer any sort of edge over his Spanish rival in the so-called “GOAT” debate (short for “Greatest Of All Time”).